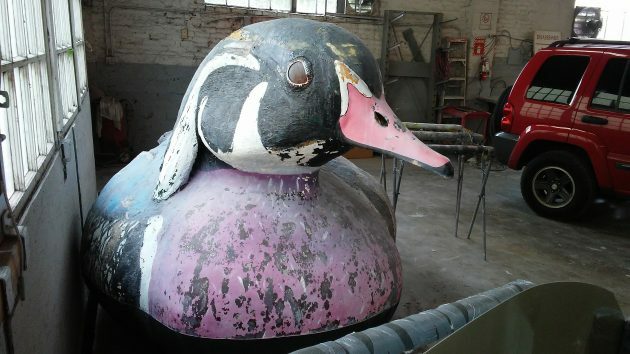 At Main Auto Body Monday: The Waverly Lake duck has been drying out since its move there..
What’s new with Albany’s Waverly duck? The main thing is that the fund drive to pay for its restoration and return to Waverly Lake has been crowned with success, thanks largely to one whopping gift. Councilman Ray Kopczynski has been running a Go Fund Me campaign to raise private funds for the duck project. Earlier, the city council accepted city ownership of the item from the widow of its previous owner. But the council didn’t want city money to be spent. A few days ago Kopczynski reported that the drive had received a donation from Darlene Chambers, of Dever-Conner — for $3,000. This amounted to more than half the goal and put the drive over the top. The total now is $5,200, including contributions directly to the Albany Parks Foundation. It covers the likely cost of restoring the polyurethane-and-fiberglass sculpture and probably a couple of years of maintenance once it is returned to Waverly Lake. The duck has been moved from its outdoor resting place on a First Avenue lot to a corner of the shop at Main Auto Body downtown. It’s drying out before work starts to fix its fiberglass shell. Here’s hoping “certain people” at Albany P & R don’t get their hands on the restoration/maintenance $$$ first! Excellent bit of news! …but wait ! ..as long as the restoration color scheme is not green/yellow with a BIG o. Likely a crime against nature, ‘cuz no ducks like that without painting.